2-7 –Federal Base Anybody Out There? Label logo on back cover is "ZYX Music". Label logo on both discs is "ZYX Records". There is a similar edition which has "ZYX Music" logos on both back cover and discs. 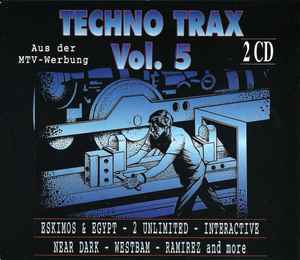 This compilation marks a new period for Techno (and you can compare it against the previous Techno Traxx releases). So we got the amazing - "Heute Ist Ein Guter Tag Zu Sterben" coming after silly "Wo Ist Pippi? ", the headbanging - "El Ritmo Barbaro" followed by - "Phantom Of The Opera" which is a bad joke, and then FSOL with "Papua New Guinea" - what the hell is it doing here? The Classic "Stella" and another operatic bad joke which close this compilation. This is not a bad compilation at all, but I think it could be much better if they put the Rave hits on one CD, and the quality anthem on the other. ooh, and also remove the FSOL track from here. It's too "sacred" to be released on such a cheap commertial release like this one.